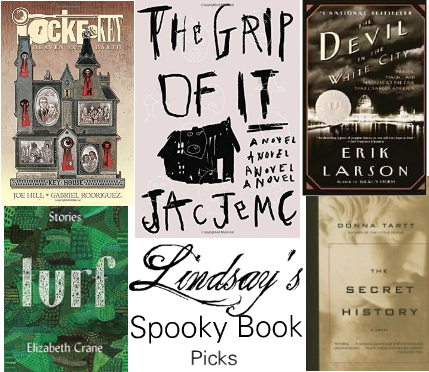 Spooky Stories for Bookish Moms — Stay Cool, Mom. I'm pleased to share a guest post by the supremely clever, Lindsay Muscato. Lindsay is an editor and writer in Brooklyn, NY, working on many projects simultaneously, including a podcast about unsolved mysteries. She's an expert on all things literary! Aren't you dying to know what she's reading? Well, lucky for us, I got her to share!! A young couple buys a new house, but it's already occupied… by something otherworldly. Sounds like you've heard this story before, right? Jac Jemc takes the classic haunted-house story and deepens it, making it a tale about a marriage unraveling and the slippery grip we all have on what's real and what's fake. Here's one about another kind of haunted house, one that's full of secret doors and menacing spirits. Graphic novels like this are the perfect escape from reality—an easy read with a complex story. Locke & Key is a portal into a tangled, richly imagined world of treachery and spirits. Just the opening is enough to chill one's bones: we instantly find out who died and where. The rest of the book is a first-person tale leading up to the incident, cracking open the subtle, twisted ways that good people, and their good intentions, can quickly go wrong. This one's a classic grisly page-turner—a true story, this time. It's about a notorious serial killer, who lived in Chicago around the time of the 1893 World's Fair. It's not for the faint of heart— the stories are gruesome, and, well, it does make you wonder what your neighbors are hiding, even today. This short story collection is completely different from everything else on the list. It's not horror, but it's full of alternate universes and queasy realities. Each story feels like a unique jewel-sized offering—a piece of candy, offered in the dark, waiting to be unwrapped. Lindsay, in da flesh. Check out Lindsay's website for more great stuff! I have an October ritual of re-reading as many Harry Potter books as the month allows. I plan on breaking with tradition... The Grip of It arrives Wednesday! Cover photo by Red Magazine. Oct 13 Work Capsule: Check-in!